Little Stars is our wonderful all-age group of babies and toddlers (0-5yrs) that come with their parents, grandparents, carers and childminders. We gather in St. Mary’s Church in Bridgnorth every Thursday morning during term time, 9:30am to 11am. Our weekly activities are planned termly by a wonderful group of parents and volunteers. We aim to offer opportunities to develop children’s cognitive, physical and social skills as well as a bit of good old-fashioned messy play and crafts! EVERYONE is welcome, no need to book, we just ask a £1.50 contribution per family when you attend, if you are able. We have a short time of story or song which leads into snack time with drinks, fruit and biscuits. From time to time we love celebrating special occasions with parties and meals (and our very popular Teddy Bear’s Picnic!) We are also planning a fundraising coffee morning for local charities too! Hot drinks are provided for adults - if you’re at a loose end at 10.30 on a Thursday why don’t you join us for a chat? The church is fully open for everyone to explore – it is your building too after all! We enjoy sharing through story and song the principles of the Christian community that meet in this wonderful building – the greatest of all being hospitality, love and friendship. Changing facilities are available in our fully accessible toilet. 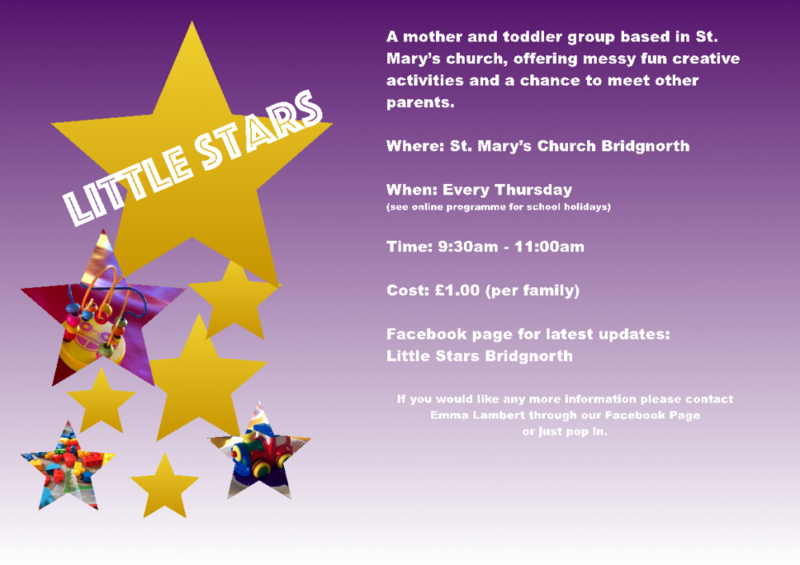 Please feel free to like our Facebook page: Little Stars Bridgnorth where regular updates, programmes and specific dates are provided. You can also contact Emma Lambert on this page.